The Longines HydroConquest USA Edition is a classic stainless diver with a distinct USA flair of patriotism. It’s heavy duty construction feels durable and solid, the Longines brand and reputation gives solid cred, and the USA edition flare makes it special. I wore the HydroConquest for a week, and at the end of my time, was comfortable with it in board meetings as well as on the weekend. If I had the opportunity, I’d easily be taking this piece along with my on an upcoming scuba diving trip. 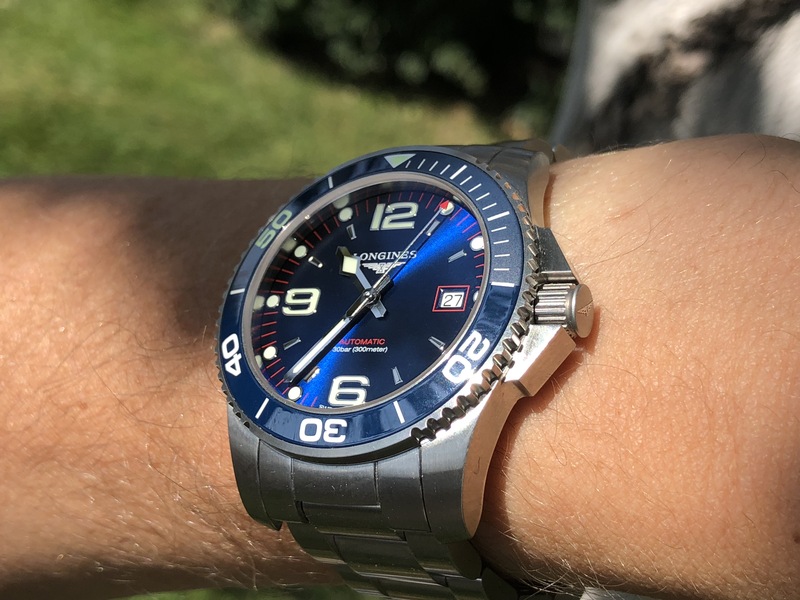 The HydroConquest is a solid diver. Heavy, yet refined stainless steel links, protective wedges around the crown, and a domed, machined caseback come together to make the HydroConquest feel solid on the wrist, and gives confidence to take this piece deep. However, it’s not all brawn. the fine indexing on the bezel and face, well placed numbers and markers, sleek lume, and polished hands give this piece a sense of history and elegance essential for every day wear – either on the sea, or at the office. In addition to the basics of the HydroConquest, I also appreciate the USA edition’s flare. The USA on the face, red/white/blue color scheme, and most interestingly the glowing “50” on the rotating bezel. That attention to detail helps give this particular HydroConquest a special air and patriotic flair. Date – Simple day number. Easy, but not sure if it’s necessary. Rubber Strap – Despite the auxilary strap supplied being rubber, it’s textured to look like a fine canvas. The strap wears nicely, and remains comfortable after a full day. Of all the rubber straps I’ve worn, this is certainly the most comfortable one. Steel Bracelet – Heavy and solid. Since this is a 300m diver watch, this bracelet includes a divers extension – an essential feature I wish I had on all of my diver watches. Instead of the red paint on the secondhand, how about a spot of lume? Those wedges protecting the crown – they’re angular and protective.. but kinda sharp. Tone it down a little? The Longines HydroConquest USA Edition is a patriotic twist on a classic and solid diver. It feels equally at home in the water and in the office, and is a solid every day wear. Who we think it might be for: Classic diver looking for a beefy dive watch that can pull double duty at club meetings. What spoke to me the most about this watch: USA! USA! Main Functions Hours, minutes, seconds, and date. Previous articleGet ready for new Klokers – blue dials, bell case, rose gold, and… SAPPHIRE! Next articleBuckle up, it’s seatbelt strap time again with Cincy Strap Co.